Parisian architecture and Fall colors is such a beautiful combination. 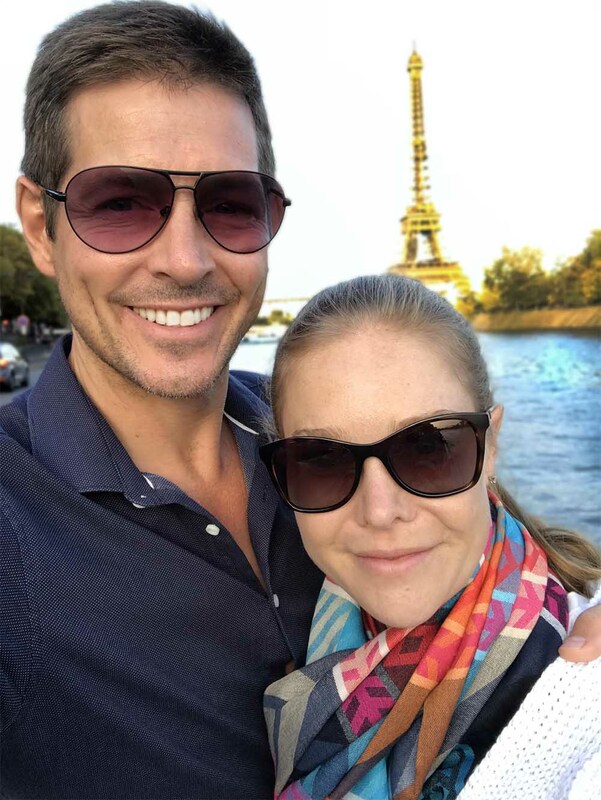 We arrived in the late afternoon, dropped our bags at our Airbnb in the 16th arrondissement, and headed straight out for an evening stroll. Before too long we found ourselves sitting at an outside table at a neighborhood bistro, sharing a plate of steak-frites, and watching the world go by. The three of us managed to stay out just late enough to keep the jet-lag at bay, ready to hit the streets again in the morning. Exploring Le Marais with Rosie! To kick off our first day I thought it would be fun to explore Le Marais, a neighborhood that straddles the 3rd and 4th arrondissements and is known for it's old-world charm and trendy galleries, boutiques, and brasseries. A freshly baked croissant in Paris is one of life's most divine simple pleasures. We Ubered our way there, enjoyed the obligatory cafe au lait with croissant, and wandered the cobblestone streets on foot. It was so unseasonably warm that we didn't even need coats. Bliss! We visited the Musée Picasso, in the extravagant Hôtel Salé. Rosie has accompanied us to many galleries, and she has become quite vocal about what she sees in each painting. It's something we initially encouraged, but in the particularly hushed galleries of Paris we've come to realize that we now need to work on "inside voices"! Inside the Musée Picasso. I was pleasantly surprised that the stroller was allowed in! We dined at Benoit for lunch, a quintessentially Parisian bistro that's been open since 1912. Sharing a (delicious!) gougère with Dirty Bunny. After a very indulgent lunch, with full stomachs and happy hearts, we ventured back to the apartment in time for Rosie's nap. 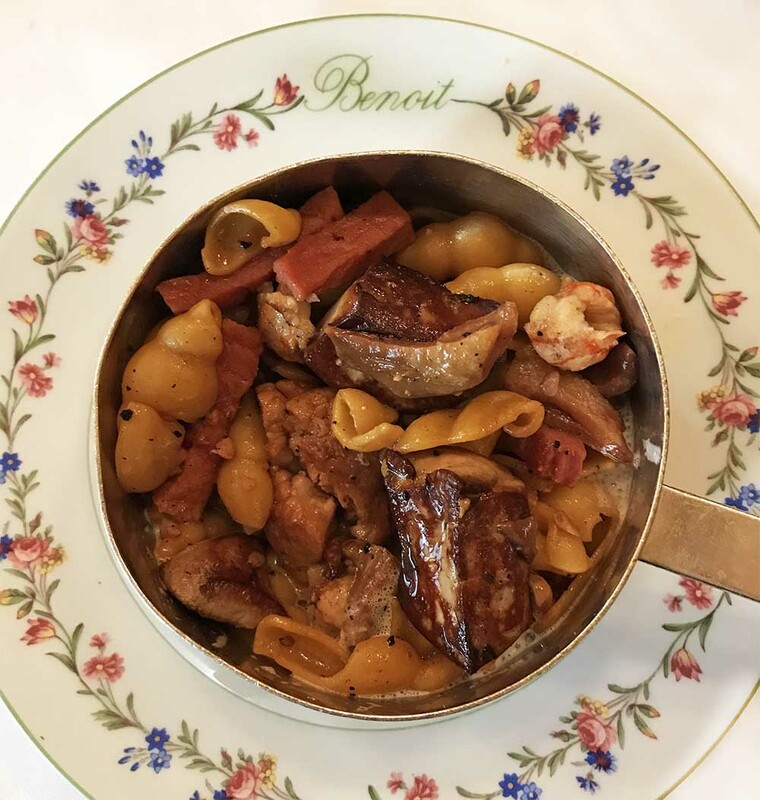 A very rich dish of veal sweetbreads, foie gras, bacon, shrimp, and pasta. Utterly mouthwatering, but good for two people to share. For our evening's adventure we wanted to walk to the Eiffel Tower from our apartment, like classic tourists, in time for the sunset. 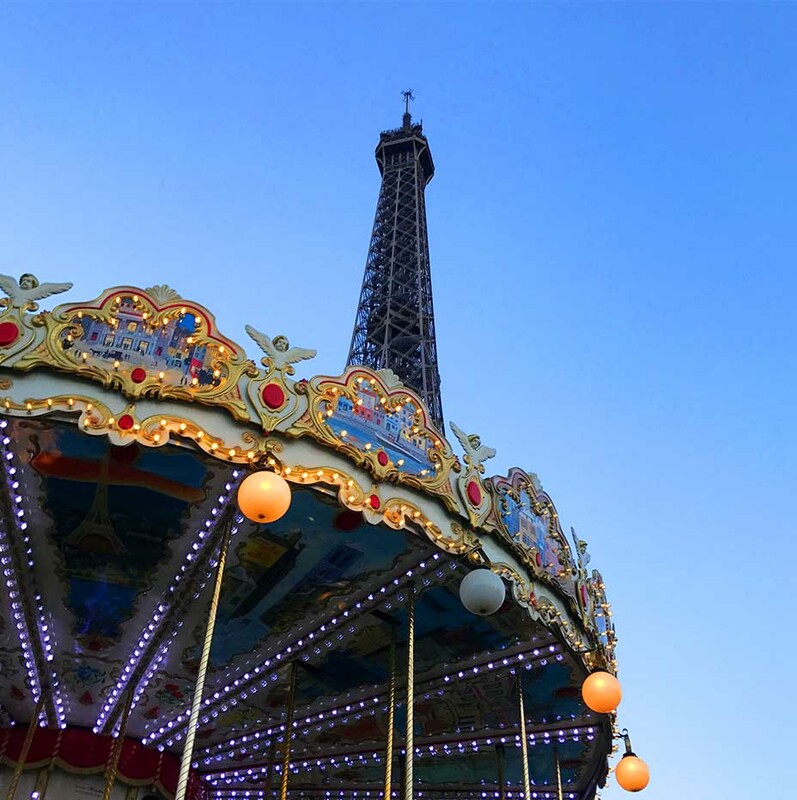 We took selfies in front of the Eiffel Tower, watched all the newlyweds pose for their wedding photos, and rode on the carousel. Rosie's first time holding on all by herself! Just when we thought our day couldn't be any more perfect, we stumbled upon this group of locals dancing to Swing along the banks of the River Seine. This morning was all about pain au chocolats and shopping. I bought this jacket to go with these shoes. Justin scored too :-) Shopping in Paris is a little too easy! The Grand Palais des Champs-Élysées, a masterpiece of Art Nouveau. After Rosie's nap we walked to the Grand Palais des Champs-Élysées to see their Gauguin exhibition. Gauguin is one of my favorite 19th century painters, and now that we live in Bali I appreciate his work from the tropics even more. It was a beautiful long walk, with lots of stops along the way for restorative drinks, and the exhibition was excellent. Rosie was unbelievably excited to spot a "gecko" in this painting (bottom left corner). Justin and I had set aside tonight for a romantic date night, so we raced back to our apartment to get Rosie organized and asleep before our babysitter arrived. Then we set off for dinner. A commanding statue of Winston Churchill outside the Petit Palais. As a special treat we had dinner at Le Meurice. The dining room is decorated in the most extravagant, over-the-top Louis XVI style that there is no doubt whatsoever that you are in France. The menu was all about Autumnal produce and comforting classic cooking. After many, many courses, a refreshing quince sorbet, and a very satisfying cheese board, it was time to head back. 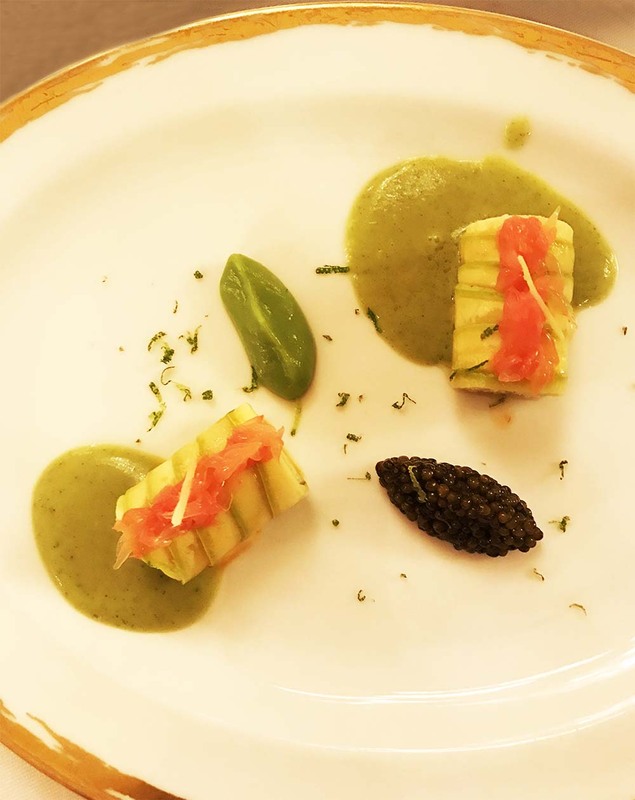 The seafood course at Le Meurice; crab and caviar, with a lovely sorrel sauce. And just like that, our 72 hours is up and it's time to head to the airport. Au revoir Paris! Merci Paris... Until next time.